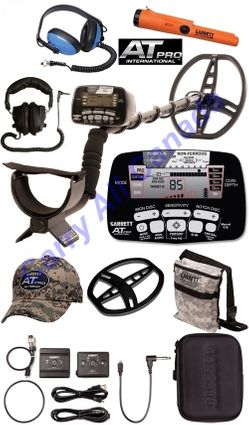 “When we heard that Garrett was developing a new all terrain metal detector, we were excited. They have finally answered the question that so many treasure hunters have been asking. Which one detector can I buy for land and water use? The new Garrett AT-Pro boldy answers that question and creates a new segment in the market. Finally one detector that does it all!” Michael Bernzweig, Detector Electronics Corp.
Standard and professional audio modes – Standard Mode provides conventional target response for easy operations. Experienced users can select Pro Mode to obtain more advance audible Target ID to judge target size, shape, and depth. Fast Recovery speed – Pro Mode Audio offers greater ability to pick out good targets amongst trash and fast recovery speed on multiple targets. Pro Mode Audio™ – Proportional Audio and Tone Roll Audio™ features allow the user to hear characteristics of a target as in a True All-Metal Mode. High-resolution iron discrimination – Use touchpads to set iron discrimination in one of 40 levels for the precise ability to separate good targets from trash. Iron Audio™: Advanced iron identification – Allows user to hear discriminated iron (normally silenced) and to alter the detector’s mid-tone signal’s range in order to avoid digging undesired ferrous targets. All terrain versatility – Waterproof housing and connectors protect against dusty muddy, wet and humid environments. The AT Pro can be immersed in water to a 10-foot depth (maximum) to search in and along shorelines, rivers, piers, docks or swimming holes. Digital Target ID – The 0 to 99 Target ID scale offers increased ability to distinguish one target’s conductivity from another. Manual Ground balance – Allows user to manually adjust the detector’s ground balance to reduce the detrimental effects of ground mineralization. Fast Track™ Ground Balance – Automatic feature that allows user to quickly ground balance the detector in mineralized soil conditions. Electronic Pinpointing – This All-Metal Mode function is used to precisely locate a detected target’s location in the ground. 15 kHz High Frequency – Offers improved detection of small targets, gold nuggets and jewelry. Land headphones and Underwater headphones are included. Garrett AT Propointer is also included.